Accurate Florida shark facts will reduce your fears on the Florida beaches. Let's face it. 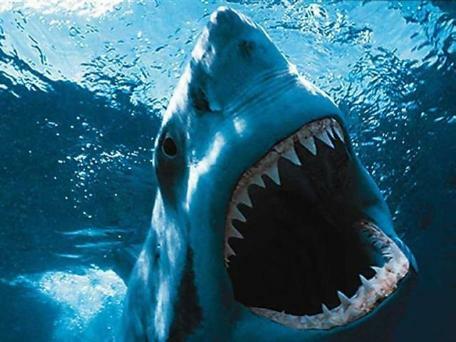 Ever since the movie JAWS hit the screen in June 1975, our fear of sharks has increased geometrically. It seems like every visitor to the Florida beaches asks, "Are there many sharks out in that water?" You really do not need to have unreasonable fear of a shark attack during your Florida beach vacation. Ester Pence is 75 years old. She moved to Treasure Island Beach 30 years ago. She said, "For the last 25 years, I have been swimming from Sloppy Joe's Restaurant, down to Caddy's Beach Bar, everyday. That's about a mile. It takes me about 30 minutes, because I'm older now. I never even think of sharks. I swim all summer, and in the winter I put on a wetsuit. Unless there is a hurricane churning up the Gulf, I do not miss a day. I'm probably about 30 yards off-shore, and I do not have the most efficient stroke, so I might even sound like a wounded tarpon for all I know. Still, I've never had anything bump me, and the only big thing I've seen in the water has been a manatee. I've never even heard of a shark attack on any of the barrier islands off St Petersburg. I'm actually more frightened of drunk guys hitting me with a Sea-Do, or even a motorboat while they are showing off to people on the beach. I'm also real anxious about stepping on a sting ray when I put my feet down to stop." First of all...yes, there are sharks in all the ocean waters off the Florida coast...BUT they are not 30 foot Great White Sharks and the incidence of a shark attack is extremely remote. 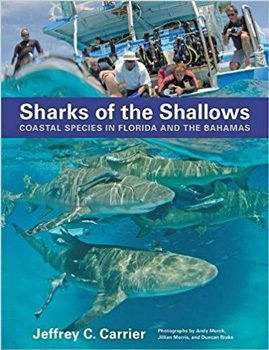 Even though I once heard that anyone who swims in the ocean has been within 10 yards of a shark once in their life, I am in the Gulf everyday and the only shark I have ever seen was in the Clearwater Marine Aquarium. * Shark attacks along the entire coastline of the Florida beaches averages only about 20 in the whole year, although there were 32 reported in Florida during 2007. * Most shark attacks occur between sandbars. It is not real smart to swim out past the first sandbar on each beach you visit. There is usually a big drop off on the other side and this is where sharks feed. 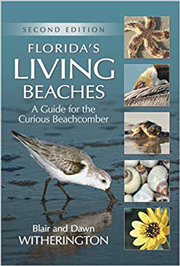 There are several things you can do to help you feel more safe swimming in the ocean during your Florida beach vacation. Just like you have to be vigilant during Stingray Season on Florida beaches there are some specific behaviors you need to keep in mind. * Do not enter the water if bleeding from a large open wound or if menstruating. * Don't swim at night. It is best to get out before twilight. This is when sharks feed. You do not have to be out on the sandbar to experience a beautiful Florida sunset. (That's why we have beach bars.) This shark fact should be pretty evident. * If you see lots of fish (like mullet or baitfish) swimming and jumping out of the water, that usually means a bigger predator is in the area looking to make a meal out of them. Get out of the water until they pass. * if you notice a lot of seabirds diving to feed, that means there is plenty of food available...and a real big fish will be attracted to this activity. 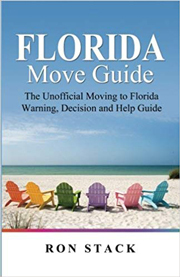 * Don't swim or surf near the jetty's of passes (openings from the ocean back into a bay) like Blind Pass or Johns Pass. The water runs real fast in those openings...and carries lots of food for sharks to eat. * Stick near others when out in the water. Sharks stay away from lots of activity. * Don't swim out past the first sandbar. * Don't stand and fish in water off the beach. There are plenty of piers, docks and jettys to fish from. I have a real problem with people who fish on Florida beaches where people swim, anyways. They deserve to be bait for a shark. Have you ever seen a cute 7-year old girl with a fish hook in her foot? End of discussion. 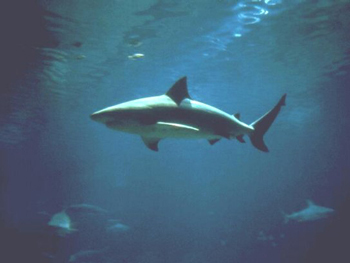 Bull sharks are the predators most prevalent in waters off our Florida beaches. They are big, territorial and aggressive. They are responsible for almost all Florida shark attacks. 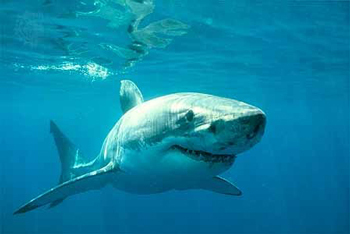 Many scientists see it as the most dangerous shark in the world. They grow to about 11 feet long and live between 12-18 years. Note: They like to feast on stingrays and seabirds. Keep that one in mind. Although shark attacks are extremely rare on Florida beaches, this doesn't mean you should go brain-dead when in the water on your Florida beach vacation. 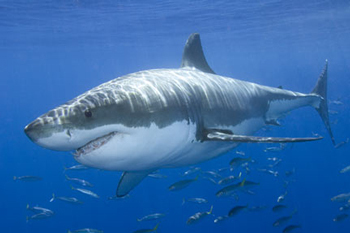 You can be vigilant with these shark facts, but you don't have to be paralyzed with fear. Buy A Fossilized Megalodon Tooth!